I had been quilting for only about 6 months when a cousin of mine announced this project for our grandmother’s 80th birthday and solicited my help. We divided and conquered; she pieced blocks by machine and I pieced by hand. We laid out the design together by pinning flannel to her dining room curtain. She sewed the blocks together and I tied. I sewed on the binding during an 8 hour car trip to Virginia from Boston for the birthday party. My dear DH drove all the way. That was 16 years ago. 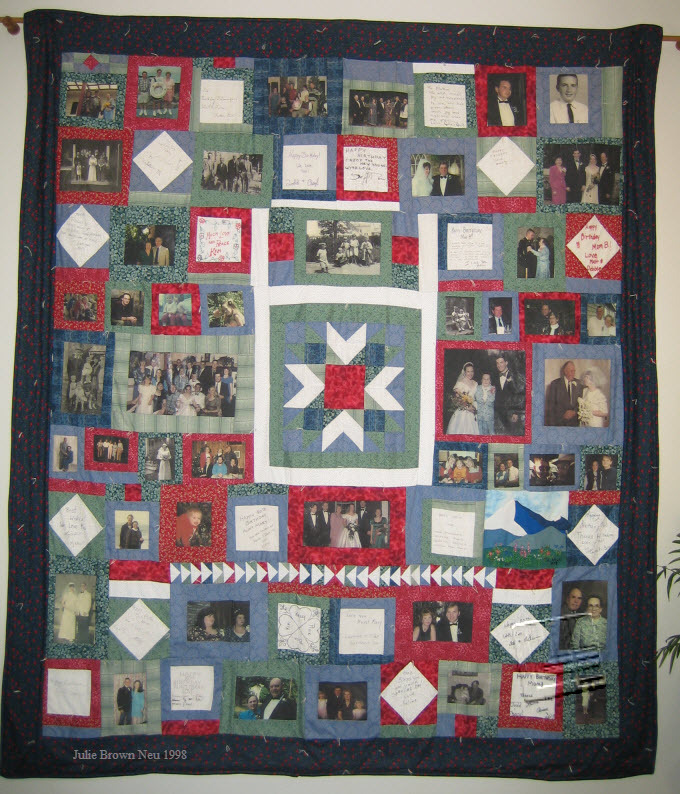 The quilt hung in her living room and then when she moved into an apartment in an assisted living facility, it hung over her bed. It was hanging over her bed three weeks ago today when she passed away. I may never make a more important quilt.